Are you in the market for a bike for your 5-9 years old son? Well, its a jungle out there, and finding the right one may not be as easy as you think. But through this Raleigh Rowdy 20 Kids Bike review, your work will be much easier. The well-crafted aluminum frame and wide wheelbase make off-pavement riding a lot easier. The sturdy frame of the bike contributes volumes to a smooth ride, even in rough terrain. It is effortless to shift between the 6-speed gears on the bike, with just the flick of a wrist. With that said, let’s dive deeper into this review with a closer look at the features. My nephew just recently got a Raleigh Rowdy 20 for his birthday. The assembly process was made easier by the fact that, the aluminum frame is as lightweight as they come. The frame is very sturdy and goes for smoother and stable rides, especially on rough bike terrain. Another benefit of the aluminum frame is that is that it makes riding a joy since not much effort is needed to propel the bike forward. This takes a tremendous load of your son’s back. Also, the standover height of the frame is low and this facilitates easy getting on and off the affordable bike. During the assembly of my nephew’s bike, I noticed how effortlessly the gear shifter switched between the 6-speed gears. All it took was a simple flick of the wrist. The chain moved from one cog wheel to another easily as I pushed down on the pedal. The advantage of this feature is that your son will not get blisters on his hands as he struggles to switch gears. It also allows him to concentrate more on riding his cheap bike smoother and more efficiently. This makes the experience more enjoyable bike riding for your son as he learns to ride. Stability is important, especially if your son is learning to ride for the first time. The 20″ wheels and 2.125″ tires offer a wide base, which distributes the weight of both the bike and your son effectively. This ensures he rides steady, whether on paved roads or dirt trails. Another thing that I noticed on the tires is their grip. The treads in the tires are deep and well distributed. The grip provides safety in case your son rides his bike over a puddle or any other wet surface. This also contributes to a steady ride. The tires have air tubes and the pumping is quite easy to do. The Raleigh Rowdy 20 comes from the manufacturer halfway assembled. The assembly process for my nephew’s bike took close to an hour and a half. The instruction manual is easy to read and understand. The parts are well grouped and organized. I used a number of tools during the process like a screwdriver, adjustable wrench, cable cutters, and a tire pump. The instruction manual claims that if you are not skilled in bike assembly it will take you about two hours to get it done. If you are an expert, 30-60 minutes will be enough for you to get through this task. Compared to other bikes out there the Raleigh bikes is more pocket-friendly. Other high-quality bikes go for between $400-1500. With expert assembly, however, you will incur an additional cost of $60. This allows you to get your son a good bike without having to break the bank. Considering how fast kids grow, it won’t feel like a complete loss when your son grows out of the bike and can’t ride it anymore. With its compact size and excellent design, the Raleigh Rowdy 20 is easy to put away. You can fit it in the back of your trunk when you want to take your son out to a dirt trail. However, due to its relatively huge wheels, it might be a bit of a struggle fitting it in some car trunks. This can be solved by strategically angling the front tire. Inside the house, the bike will take up minimal space and you’ll hardly notice it there. Hopefully, your task of finding a good bike for your son has now been simplified. 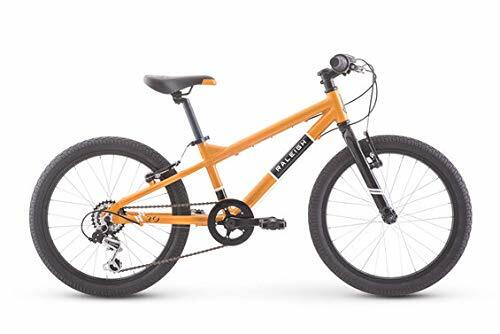 With this Raleigh Rowdy 20 review in mind, recommending that you get it for your son is now easier. Considering its weight of 26.8 pounds, stability, pocket friendliness, and the other wide range of features it boasts, this is the bike to get your son started on riding. So, go get your son one of these bad boys’ and watch the smile on his face as he rides down that dirt trail.